Dr. S. K. Sundararaman, CII Chairman, Coimbatore Zone, inaugurated the camp. In his impactful address, he explained how sustainability, focus on cash flows, being critical of oneself, and great leadership helped entrepreneurs build great companies. Speaking about how this was the most congenial time for entrepreneurs in India, he said important factors include networking, ability to come up with simple solutions, a great vision, having the right people for the right job and emotional quotient. He advised budding entrepreneurs to develop maturity by working for a few years in some good companies and gain experience, before taking the plunge into an entrepreneurial venture. Dr. Bharat Jayaraman, Dean PG Programmes, Amrita University spoke about Mata Amritanandamayi and her unique contribution to entrepreneurship in helping Amrita create safety devices for women and develop the low cost insulin pump, for example. He spoke about the need to have belief in oneself. Dr. K. A. Narayanankutty, Head L&D (Technical) proposed the vote of thanks. After the inauguration, Ms. M. Asha Devi, A.E., District Industries Centre (DIC) highlighted the various financial schemes like UYEGP, CGTMSE, NEEDS and PMEGP. She explained how DIC facilitated the entrepreneurs not only with guidance and financial support through loans and subsidies, but helped them in getting clearances, recovering dues and even getting awards. The participants then went on a factory visit to Roots Industries India Ltd., where apart from the guided tour, they had an interactive session with the Executive Director, Mr. K. Saravanasundaram. The second day started with a session on technical & commercial aspects of SSI unit by Mr. M. Palanivel, Dy. Director, MSME Development Institute. This was followed by a highly informative and lively, thought-provoking rendition of ‘How to start a SSI unit’, covering Government formalities, rules and regulations, location and different aspects of an industrial venture, by Mr. D. Jayagopal, Chairperson, EDP Cell, CODISSIA. Mr. R.S. Pillai, DGM (Retd. ), PNB, dealt with the financial aspects of SSI units including salient features of a project report, while Wing Cdr. A. Balachandran, ACE dealt with the identification of business opportunities and mechanisms of product selection. Day 3 began with a session on ‘Historical background, Indian values vis-à-vis entrepreneurship and the present scenario’, dealt by Mrs. J. Mohanasundari, MD, Sharp Electrodes, who touched an emotional chord with the budding entrepreneurs. Thereafter, Mr. A.S. Murali, Chief Research Engineer, Fluid Control Research Institute, (FCRI), handled the topic - ‘Technology assistance from R&D labs and other institutions on choice of technology’. This was followed by the subject, ‘Creativity and business – the man behind the venture – the behavioural scientist’s approach’, dealt by Dr. K. A. Narayanankutty, who is the chief mentor for all projects at ACE. Then, TiE charter member Mr. B. Krishnamurthy, MD, Best Known Methods & Solutions shared his knowledge on ‘Communication skills for better results in business’ with the budding entrepreneurs. The participants of this camp were budding entrepreneurs studying at Amrita University, as well as members of ACE who had registered themselves to attend this programme, funded by DST, routed by Entrepreneurship Development Institute of India, Ahmedabad. 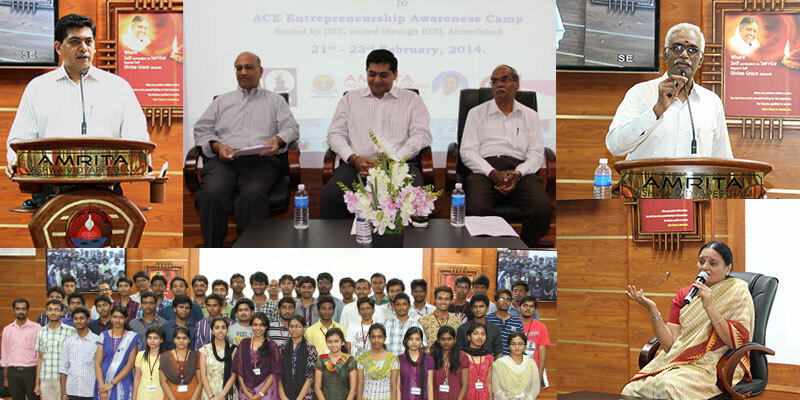 The 3-Day entrepreneurship awareness camp covered all important aspects of entrepreneurship dealt by experts, and motivated the participants to look at entrepreneurship as a serious career option, apart from earning them certificates.